What Are the Best Natural Remedies for Bad Breath? Natural remedies, home remedies, and DIY treatments are all the rage right now. The power of the internet and social media has given us the ability to share information instantly. Because of these technological advancements, we’re seeing an increased amount of men, women, and children showing interest in maintaining a healthy, holistic lifestyle. People, now more than ever, want to avoid the potentially harmful treatments that we once thought were trusted resolutions. Because of this distrust in consumer products and corporate enterprises, many sects of society are searching for “do-it-yourself” cures for our ailments and using a homemade solution to eliminate bad breath is no exception to this rule. There are a multitude of foods, herbs, and liquids that have been touted to be natural remedies for bad breath. Most of these proposed natural remedies involve chewing certain items or gargling with solutions in the hopes the enzymes or oils will kill bacteria in the mouth and eliminate bad breath. This provides an immediate fix for bad breath, but it’s often only temporary because the bacteria will return, and with it, bad breath. 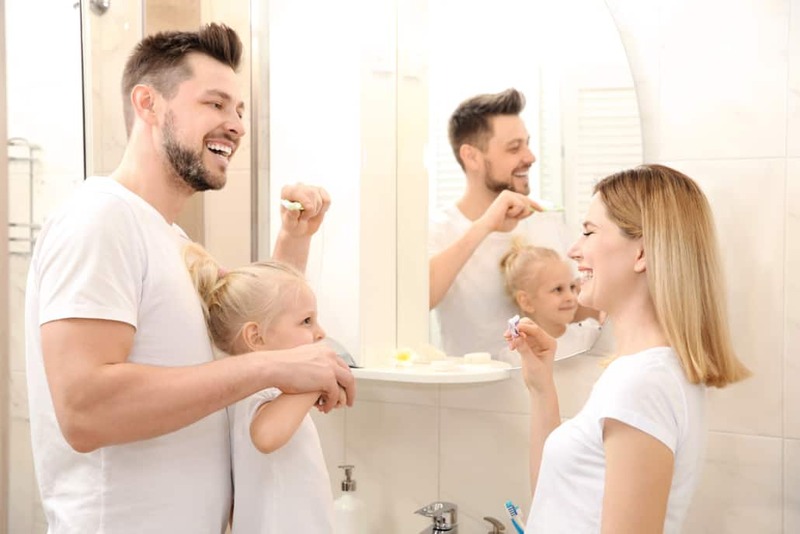 Instead of relying on alternative products that we use to ingest or rinse, behavioral remedies are preventative practices that anyone can implement into your daily routine in hopes to improve oral care. Even though all the behaviors mentioned above are positive attributes towards a healthy lifestyle, they may only have a minor impact on minimizing or eliminating bad breath. Now, for anyone who might have chronic halitosis that goes beyond the normal, everyday bad breath they may want to visit their doctor to rule out a more serious issue before navigating down this avenue. Do Natural Remedies for Bad Breath Really Work? While there are a number of common-sense home remedies for bad breath, the real question is will they work for you? Certainly, daily brushing, flossing, drinking lots of water, or chewing on parsley or cinnamon will get rid of bad breath, but for how long? Five minutes of bad breath relief isn’t enough. If you’re anything like most people, almost every home remedy that you’ll ever attempt becomes an unreasonable and messy trial and error process that ends up either being tossed in the trash or thrown in the medicine cabinet never to be heard from again. There’s simply too much to do in our everyday lives for us to efficiently go about trying the multitude of options. If you have kids, a family, a job, a life, you definitely don’t have time to run all over town, buy a million different ingredients and take them home and see what works. The goal is to find a remedy that works without a hitch, but to do that, we need to figure out the underlying cause of bad breath. You’ve no doubt heard that bad breath is caused by germs and bacteria in our mouth. That’s true, but it’s not the whole story. It turns out that our bad breath is actually caused by the sulfur gas that is released by naturally occurring germs and bacteria. It’s not the germs themselves that smell, but the sulfur gas they release when they feed on the protein particles in our mouths. Killing germs and bacteria with natural remedies may stop bad breath, but only temporarily. Since bacteria in our mouth is important for digestion, they will return to eat protein and release sulfur. By nature’s design, they must come back. There is no natural remedy for bad breath listed above that will mask the sulfur production. However, the scientists at SmartMouth asked a groundbreaking question that no other oral care company was asking. If there’s a natural solution that can stop the sulfur gas from being produced, could you eliminate bad breath? The answer is, yes! It’s activated Zinc Ions! Zinc is an essential trace mineral that is very common in the human body. It works as a natural antioxidant and has numerous immunity benefits. It’s also a key to improved eyesight, skin tone, brain functionality, and overall men’s health. Some studies have even shown it decreases the length of the common cold! But, zinc has at least one more advantage up its sleeve; it stops the sulfur gas (bad breath) that’s produced by the bacteria in our mouth. Studies show zinc ions are an effective natural ingredient in inhibiting volatile sulfur compounds(VSCs), also known as sulfur gas. This means zinc ions will eliminate bad breath by stopping the sulfur gas, not just the bacteria in our mouth. 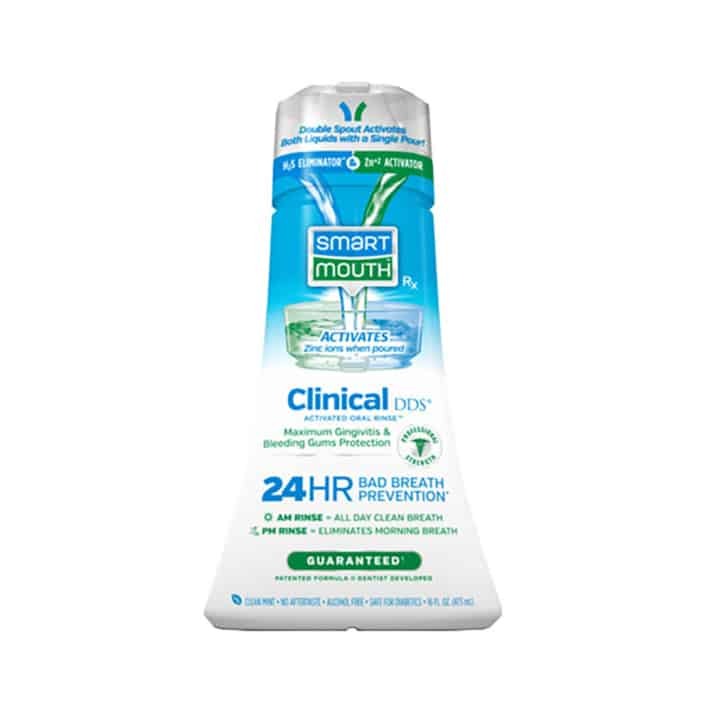 SmartMouth Activated Oral Rinse and Toothpaste use patented, clinically-proven zinc ion technology to stop the VSCs and sulfur gas and are guaranteed to eliminate bad breath for up to 12 hours after each rinse. 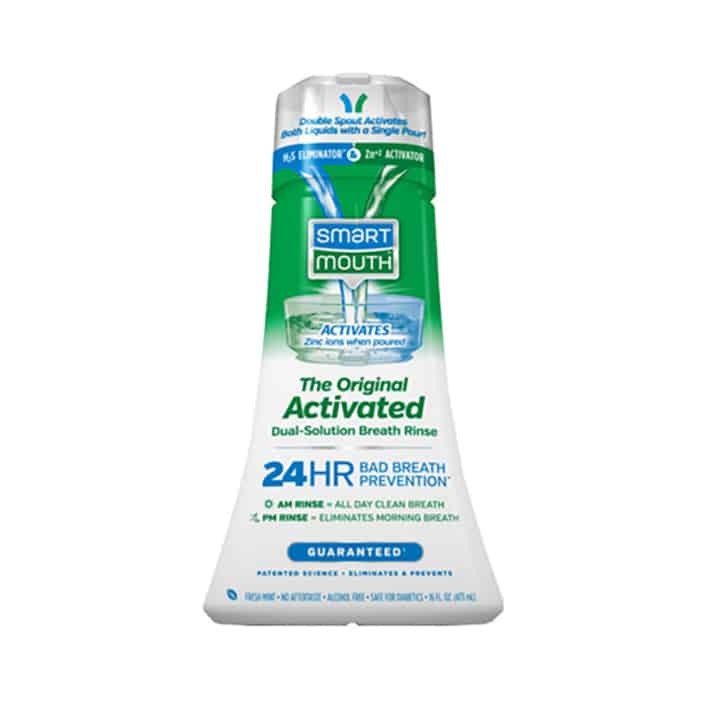 When you use it twice a day, SmartMouth provides 24-hour bad breath protection*. All due to the zinc ions that are activated when the two-liquid formula is poured. Some natural remedies can stop bad breath temporarily. If you wish to stop it at its source you must introduce activated zinc ions into your oral care routine. Regular zinc is found naturally in many foods like chicken, beef, eggs, oysters, kale, nuts, and legumes, but SmartMouth’s Activated Oral Rinse combines a sulfur eliminating solution (H2S) with a zinc-rich activator (Zn+2) to form activated zinc ions. These activated ions are far more powerful than stable zinc minerals in stopping bad breath. That’s because they prevent the bacteria in our mouth from producing the sulfur byproduct of their digestive process. The result is a full 12-hours of bad breath prevention. If you want a natural remedy for bad breath that really works, you’ve got to try SmartMouth Activated Oral Rinse and SmartMouth Premium Toothpaste with activated zinc ions. You can find all SmartMouth products in most pharmacies and supercenters in the oral health aisle. To find out more about SmartMouth’s zinc ion technology, check out this video, or visit our how it works page. You can also follow us on social media on Facebook and Twitter. *Results may vary. 24-hour bad breath protection results associated with twice daily use.SmartMouth products are not intended to diagnose, treat, cure, or prevent any disease. All SmartMouth products come with our guarantee that SmartMouth works exactly as described or your money back. Always consult your oral healthcare professional.